The T-109, otherwise known as the Messerschmitt Bf 109Z, is a heavy fighter which was designed by joining two Bf 109 (Me-109) fighters together. The T-109 was the result, on paper at least it was a single seater with the pilot sitting in the left fuselage. The T-109 would have been heavily armed with five 30 mm cannons. Four versions of this plane were planned, but only one prototype was ever built in 1942-43. Eventually the project was cancelled due to the arrival of the Messerschmitt Me 262, which was expected to perfom better. So here is your chance to fly the fighter plane that never was! Like many of our planes this model is virtually ready to fly straight from the box, all you'll need is 8 AA batteries to power the transmitter. This plane is specified with the 35Hz controller and brushed motor options, making it an affordable entry level outfit, ideal for someone wanting to buy their first plane. This model is lightweight, extremely tough, with a reinforced fuselage and wings, so it's as crash resistant as possible. The fuselage has been factory finished, and the details of original design have been carefully reproduced.. 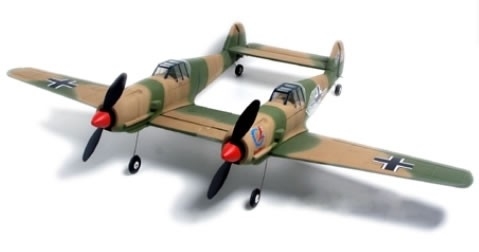 This plane features excellent stability and amazing aerobatic capabilities. Once you've become experienced, you will have it performing inside loops, outside loops, axial rolls, inverted flight, knife edge, stall turns, hammerheads, and even spins!. This plane is described as RTF or ready to fly, this means that everything except batteries for the transmitter is included in the box and that only a few minor stages of assembly remain, such as attaching the wings and tailplane. These steps should take around 30 minutes to complete.